New Horizons COGIC - East Point GA - Dr. Oliver Haney, Jr.
Dr. Oliver J. Haney, Jr.
We are blessed to have two of the greatest gifts that God can give any church congregation, Bishop Oliver J. Haney, Jr. and First Lady Laverne Haney. For 22 years at his church they have diligently and faithfully served the Lord and His people. For us they have created an unforgettable legacy. By preaching and teaching God’s word, their legacy of laboring with sincere compassion for lost souls, had caused our lives to be changed completely. They are counted worthy of receiving double honor, a more abundant provision, for demonstrating the power of holy living. Bishop Oliver J. Haney, former Interim President of the Inter--denominational Theological Seminary (ITTC) has been faithful in his calling as pastor. In previous years he has served as pastor of four churches from 1965 to the present. 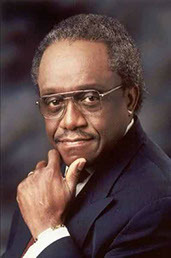 He was pastor of two Presbyterian churches Antioch in Dalton, Georgia and Ebenezer in Rome, Georgia; and two church of God in Christ congregations, Fairburn Church of God in Christ in Fairburn, Georgia and New Horizons Church of God in Christ in East Point, Georgia. Bishop Haney has traveled the world extensively, spreading the Word of God, often as a revivalist, conference speaker, and workshop leader. He has received numerous awards throughout his career and has been appointed Bishop of the [C.O.G.I.C.] Northern Georgia First Ecclesiastical Jurisdiction. Chaplain Lavern Haney has faithfully served the Church of God in Christ in numerous capacities. She has worked as the secretary of ITC in the pastoral Care Office. President of the Ministers and Deacon Wives, President of Sister in Touch Ministries, and currently serve as the Director of Congregational Life and pastoral Care here at New Horizons Church of God in Christ. Bishop Oliver and Chaplain LaVerne Haney have been married forty-seven years and have a beautiful family; their son, First Administrative Assistant and Pastor Oliver J. Haney, III, and his wife First Lady Tiffany Haney and their three wonderful grandchildren, Olivia, Oliver J. IV and Taylor. 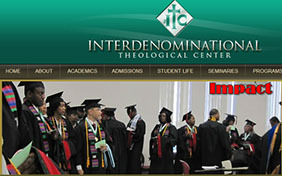 The Charles H. Mason Theological Seminary at the Interdenominational Theological Center – Atlanta, Ga. -- (hereafter cited as (ITC) is the official school for graduate theological education in the Church of God in Christ. Because of its membership in the ITC, the Charles H. Mason Theological Seminary is the only fully accredited, African- American Pentecostal Seminary in the world.